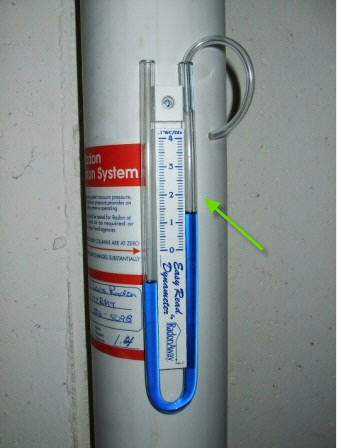 Important: The only way to know if your radon fan is working properly is a with a vacuum gauge (manometer). This device tells you if there is a vacuum being created by the fan to draw out the air from beneath the basement. 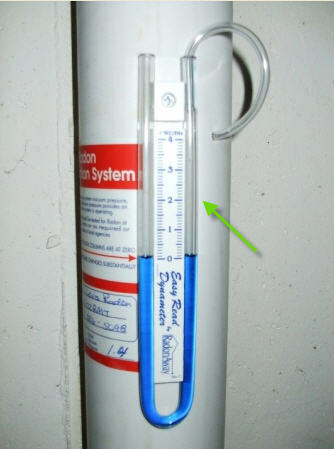 If the fan is not running and/or the manometer does not indicate the proper operation of the fan, we can replace the fan. There is some variety in the fans but it costs about $445 to provide and replace the fan. ==> Be wary of assuming the fan is doing its job just because you can hear it running. We've seen a few cases where the fan was 'running' but it was not drawing the air out.